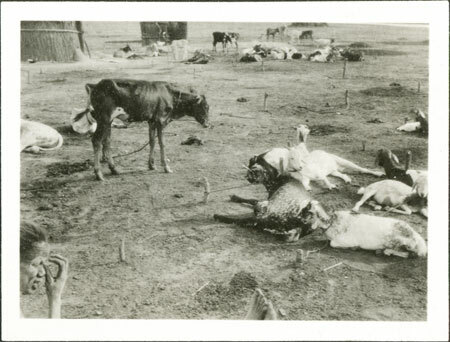 Tethered goats and calves with windbreaks just visible in the background suggest that this image was taken among the Nuer Lou during Evans-Pritchard's fieldwork at cattle camps on the Sobat River in 1931. The 35mm format of this image is consistent with other images taken at this time. Note on print reverse ms pencil - " 104 "
Morton, Chris. "Nuer animals at camp" Southern Sudan Project (in development). 03 Jan. 2006. Pitt Rivers Museum. <http://southernsudan.prm.ox.ac.uk/details/1998.346.104.2/>.